This is a tasty and quick recipe with lots of flavor and nutrition! Prepare 4 servings of couscous according to directions on box. Set aside. Warm olive oil over medium heat in a large skillet. Sprinkle top of tilapia fillets with 2 tsp of Greek seasoning. Place fillets in skillet, with seasoning side up. Cook about 4 minutes. Turn filets over and sprinkle with remaining Greek seasoning. 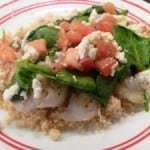 Cover fillets with spinach, then sprinkle tomatoes and feta on top. Cover skillet with lid and cook about 5 minutes, until spinach is wilty and feta is melty.